There’s a lot to see in Chiang Mai and especially during the hot season, walking from A to B the entire day can wear you off quite easily. Luckily there is almost always someone around who will gladly take you to your desired location. 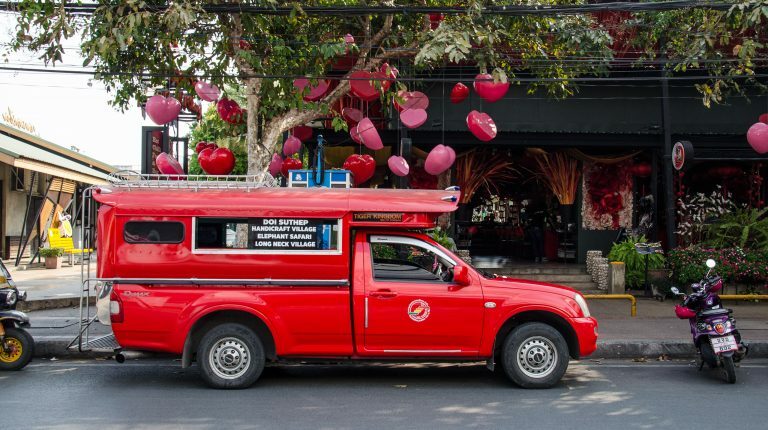 From the moment you arrive in the city, you will notice the huge amount of songthaews, also known as ‘red cars’. They are the most popular and cheapest option to get around Chiang Mai on four wheels. The name a literally means “two benches” after the passenger seating in the back of the truck. There is room for at least 8 people inside and at peak hours you will see people standing on the little platform outside, holding onto the metal railing. Is riding a songthaew safe? Songthaews don’t have seat belts, nor any other safety equipment on board. As mentioned before, you will even see people standing on the little platform outside, holding onto the car with their bare hands. 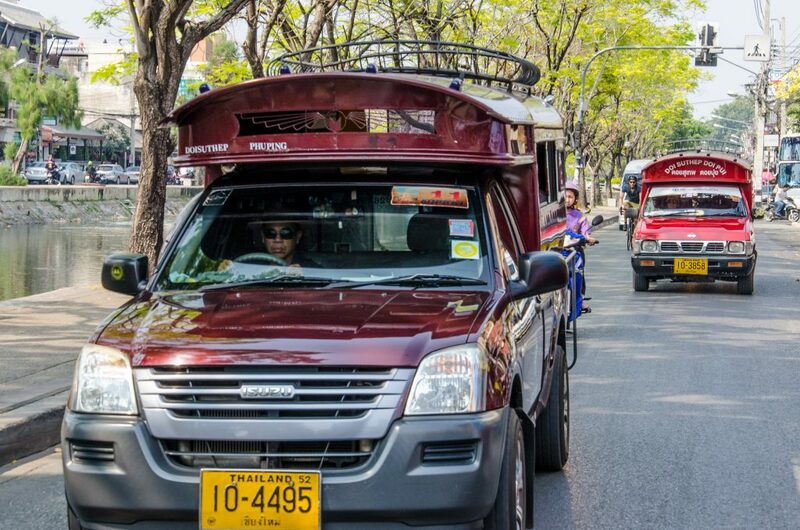 While riding a songthaew in Chiang Mai can be an adventure, the drivers are used to the many tourists that visit the city every day and mostly drive slowly and carefully. Unlike buses, songthaews do not follow a specific route: They just go where their passengers want to go. However, unlike a taxi, you are sharing the ride with other people and might not go on a direct route to your desired location. The drivers decide which route makes more sense and which passengers are being dropped off first. Apart from red cars, you will also notice trucks in other colours like yellow, white or blue. 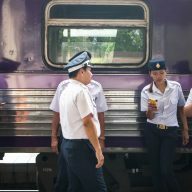 Those are only used to commute from and to the outskirts of Chiang Mai, while the red cars usually go to any location inside the city limits. How to stop the “Red Car”? Stopping a songthaew is relatively easy. Just stand on the side of the road and raise your hand to signal a songthaew driver that you want to use their service. Sometimes you will hear a songthaew driver using their horn when you are standing on the sidewalk. This basically means: “Do you need a ride?” and if so, you again just give the driver a signal or just do not react at all. If you need to stop a car, make sure that the driver can see you from a distance because traffic in Chiang Mai can become a little hectic from time to time. It is also a good idea to use a bit of common sense when choosing a location to stop a songthaew. Trying to stop a car in a corner will only put yourself and possibly others in danger, try to find a straight road with enough space for the car to stop. If you managed to stop a songthaew, you need to tell the driver where you want to go. This is probably the hardest part because a lot of the drivers only speak a few words of English. Getting to popular locations like Thapae Gate, the Night Bazaar or Nimmanahaeminda Road is generally very easy while going to a specific address will be harder to explain. 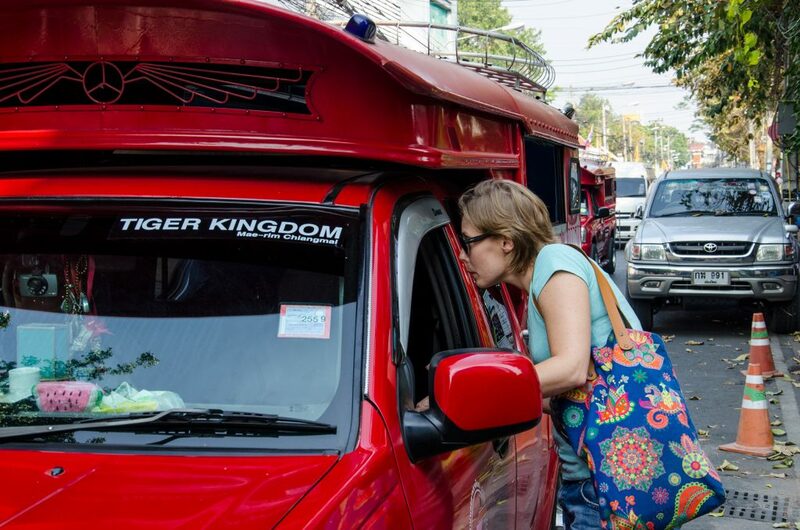 Jo explains a songthaew driver where we want to go. If you have your smartphone with you, you can try to show the driver on the map where you want to go. Thai people often seem to have problems with maps though, so look for a few points of interests like temples, schools or other attractions that are nearby. It will be easier for the driver to understand where you want to go. The more remote the area you want to go, the more likely it will be that a driver will refuse a ride. In this case, you will either need to wait for another songthaew or just stop a tuk-tuk if it seems like nobody wants to drive you. How much does it cost to ride a songthaew? 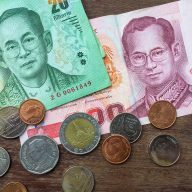 If you ask a songthaew driver how much the ride will cost, they will name any prices up to 150 Baht per person, which is what you would pay for a ride in a taxi with AC or a tuk-tuk. The trick here is not to ask the driver at all how much it costs. The general rule is, that every trip inside the city costs 30 Baht per person. So once a driver agreed to take you with them, just jump on board and enjoy the ride. 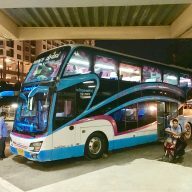 If you want to take a songthaew to the airport or to points of interest outside the city, you will have to negotiate a price with the drivers. Especially if you are travelling in a bigger group, sharing a songthaew to visit the mountains or other sights outside the city can be a cheaper alternative to the many tours you can book through agencies. How to get off a songthaew? Once a driver agreed to take you with him, take a seat in the back and wait until you reach the destination. If you have internet on your smartphone, you can track the ride on the map and press the “Stop” button or knock on the little window in the front, to signal the driver that you want to jump off. Normally, the drivers will remember where everyone needs to get off and especially when dealing with tourists they will be more helpful and give you a shout when you reach your destination. Be careful and look out for the traffic when you leave the vehicle. Then move to the front of the car from the left side and pay the driver at the window. 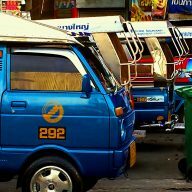 Tuk-tuks are also very popular in Chiang Mai. They are more expensive (around 100 Baht for one trip), but it is easier to catch them and it is almost always guaranteed that the driver will agree to take you where you want to go. Normal passenger taxis also exist, but they are pretty rare and more expensive than tuk-tuks. 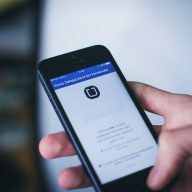 An easier way to hail a ride is by using the Uber app on your smartphone. This can be very useful if you need to go to the airport and can’t be bothered carrying your luggage to the next main road to catch other transportation. Motorbikes and bicycles can be rented from almost any tourist office in the city. It is very easy to drive around here. The traffic can be crazy sometimes, so wear your helmet and don’t forget that in Thailand, you drive on the left-hand side. Also always keep your driving license on you in case you run into a police checkpoint. Previous Post: « Do you want a Thai boyfriend? Start behaving like you are 15 again!